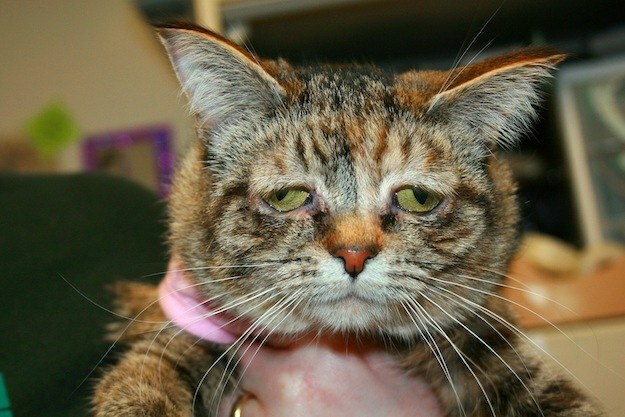 A cat whose genetic abnormalities helped her get viral fame has found the perfect home. It isn’t surprising that Tucker achieved viral fame this month after her story and photos were shared online. Tucker was born with genetic abnormalities that give her a sweetly sad looking expression on her adorable little face, and the shelter caring for her has been searching for a special home for her, where her needs can be met. Tucker was relinquished by her owners and came into the care of Purrfect Pals in Arlington, Washington, and Purrfect Pals set out to find her the perfect home, one where her special needs could be well met and where she would be happy and loved. Lil Bub is a beautiful, unique cat who was born with genetic mutations that give her an unusual appearance – and she has captured the hearts of animal lovers worldwide. Sweet Tucker was also born with genetic abnormalities and while she doesn’t aim to take the world by storm, she does hope to find a loving family of her own. Tucker came to Purrfect Pals in Washington State when her owners could no longer keep her. Just like Lil Bub, she has an unusual appearance due to her genetic abnormalities, and just like Lil Bub, she’s very cute and lovable! This unusual cat is looking for a very special home. Some of Tucker’s joints are constructed abnormally, so her new family will have to be careful to provide steps and other accommodations to make sure she doesn’t injure herself. Tucker also has an auto-immune disease that makes her skin very thin and easy to bruise. Additionally, she has hair loss because of the scabs that she pulls off. 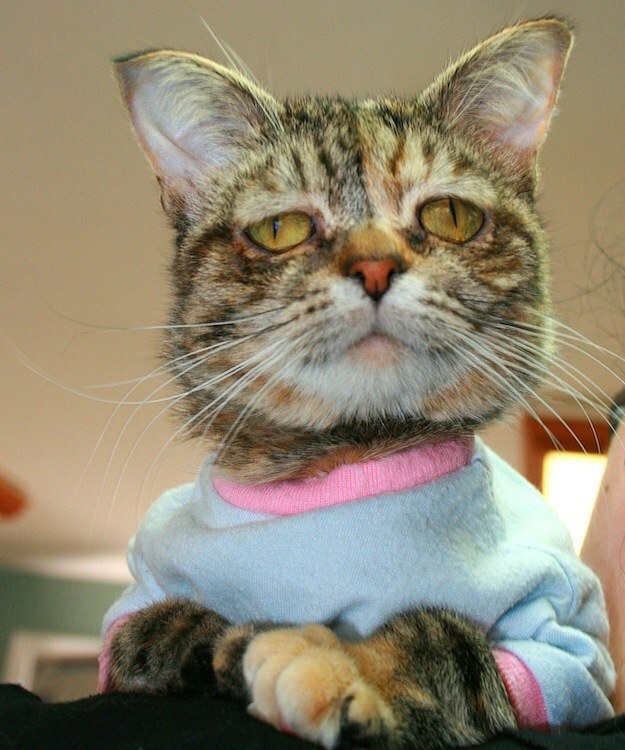 At Purrfect Pals, Tucker has been kept dressed in tee shirts to prevent her from damaging her skin. Tucker enjoys sitting on laps and playing with string toys. This loving, unusual girl especially enjoys being pet under the chin and behind the ears. Tucker loves children, too, and she’s wonderful with them. Tucker’s photos and story were picked up by media outlets from Buzzfeed to the New York Daily News and the UK tabloid The Mirror, among others. 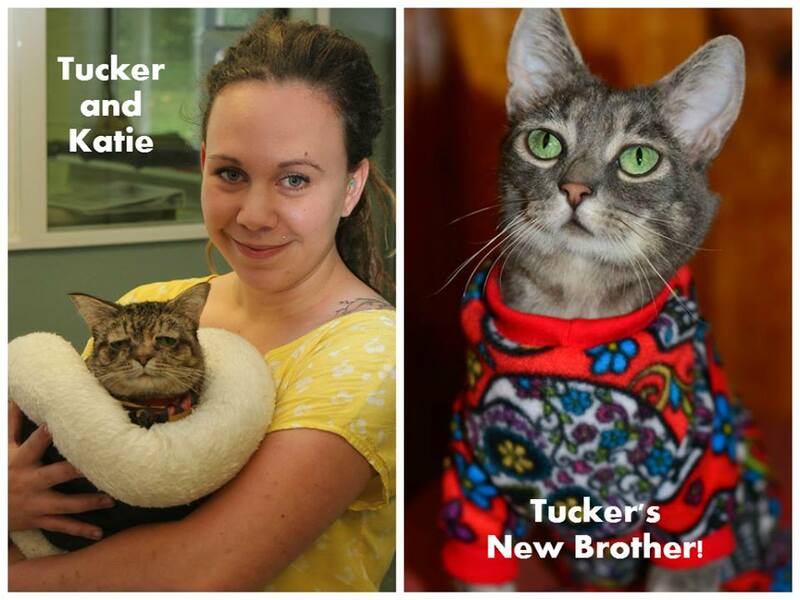 Meanwhile, Purrfect Pals searched locally for a family for Tucker. Amid stories which , in some of the more splashy cases, said the shelter was conducting a desperate search for the perfect home for Tucker, that home was quietly being found. Tracy Campion published an update in The Examiner, as well. The attention given to Tucker and Purrfect Pals will have a lasting benefit for other pets in the shelter’s care, thanks to their increased visibility. And Tucker gets her happy ending. She is so sweet! Health and happiness to you Tucker!